Analysis: Henry tore his ACL in OTAs last offseason and remarkably made it back to log 14 snaps in the Chargers' second playoff game Jan. 13. The tight end admitted he wasn't 100 percent at that point, though, and his lowly playing time clearly reflected that. It's still notable he didn't suffer any significant setbacks, so it appears he'll have a full, rehab-free offseason to prepare for the 2019 campaign. Analysis: Official confirmation of his status will arrive upon the release of the Chargers' inactives in advance of the team's 1:05 ET contest, but it appears as though Henry, who has been recovering from a torn right ACL that he suffered back in May, will make his season debut Sunday. In such a scenario, he'll provide QB Philip Rivers with another pass-catching weapon, but it's expected that the tight end will be on some sort of "pitch count" in his return to action. Henry (knee) is listed as questionable for Sunday's divisional-round game in New England, Sam Fortier of The Athletic reports. The Chargers have activated Henry (knee) from the team's PUP list. Analysis: Prior to suffering a torn ACL back in May, Henry was viewed as an ascending talent at the tight end position. Now that he's back in the mix, he'll look to regain that momentum, but it's unclear how much work he'll see in Sunday's divisional-round playoff game against the Patriots. With coach Anthony Lynn already having indicated that Henry will be on some sort of pitch count in his return to game action, the 24-year-old pass catcher is a speculative play in fantasy playoff contests. Though Henry (knee) won't play Sunday against the Ravens, he would likely be activated from the Chargers' PUP list should the team advance to the divisional round of the playoffs, Ian Rapoport of NFL Network reports. The Chargers won't activate Henry (knee) from the PUP list Saturday, Ian Rapoport of NFL Network reports. Thus, Henry won't be available for Sunday's wild-card game at Baltimore. 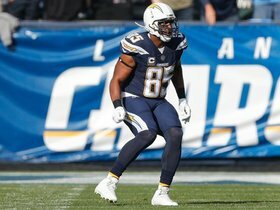 Coach Anthony Lynn said the Chargers haven't made a decision about Henry (knee) playing in Sunday's wild-card game in Baltimore but noted that the tight end will be on a "pitch count" if he suits up, Eric D. Williams of ESPN.com reports. Henry (knee) is expected to be activated from the PUP list and suit up in Sunday's AFC wild-card matchup with the Ravens, Adam Schefter of ESPN reports. General manager Tom Telesco hasn't ruled out Henry (knee) being available for the wild-card round, Eric D. Williams of ESPN.com reports. Henry (knee) returned to practice Monday, opening a 21-day window for the Chargers to place him on the active roster or rule him out for the rest of the season. Analysis: Cleared for individual drills less than seven months after suffering an ACL tear, Henry seems to be enjoying an unusually rapid recovery with eyes toward suiting up at some point during the playoffs. He'll presumably be limited to a part-time role if it ends up happening, but he should be headed for a three-down job in a productive offense next season. Henry (knee) may start doing individual drills as soon as Monday, Eric D. Williams of ESPN.com reports. Analysis: The Chargers still haven't placed Henry on injured reserve, holding out hope he can make it back for some sort of contribution during a playoff run. It's safe to assume he won't play Week 16 or 17, but a game appearance in mid-to-late January isn't totally out of the question. Henry suffered a torn ACL on May 22. Though the Chargers are hopeful Henry (knee) will be ready to come off the PUP list at some point in December, his return is still viewed as a "long shot," Adam Schefter of ESPN reports. The Chargers are hopeful Henry (knee) will be able to be activated from injured reserve at some point next month, Adam Schefter reported on ESPN's "Sunday NFL Countdown" program. With the Chargers on bye this week, Henry (knee) remains on the team's PUP list. Henry ran diagonal sprints with a brace on his right knee Friday, Mike DiGiovanna of the Los Angeles Times reports. "It's so soon," coach Anthony Lynn said. "I was amazed at how he looked today. He's been doing stuff on the side all along, but today he kind of took it to another level." Analysis: The Chargers made curious moves by placing Henry on the PUP list at the start of training camp and keeping him there after cutting the roster to 53 on Sept. 1. Despite tearing the ACL in his right knee on May 22, there seemed to be some hope that he'd be able to return during the postseason, but Friday's development may move up that timetable by the sound of Lynn's comments. While Henry continues his recovery, Antonio Gates and Virgil Green will split the TE reps between them. Henry (knee) will be on the PUP list to start the season, Field Yates of ESPN reports. Analysis: Henry tore an ACL on May 22 and is an extreme long shot to play this season, but the Chargers aren't quite ready to shut the door on the possibility. There's a good chance he's moved to injured reserve at some point, as even a deep playoff run would put him at just eight months removed from the initial injury. The Chargers are left with one of the weaker TE groups in the league, led by offseason acquisition Virgil Green. The Chargers will likely place Henry (right ACL) on IR during final roster cuts, ESPN's Eric D. Williams reports. Analysis: Per the report, Henry, who suffered his knee injury May 22 and then underwent surgery two weeks later, "is moving pretty well on the field and has been very engaged during practice." While the tight end hasn't officially been ruled out for the rest of the season, we suspect that will eventually be the case, with his long-term future in mind. Henry (knee) has been placed on the PUP list, Jack Wang of the Los Angeles Daily News reports. Analysis: Henry tore the ACL in his right knee in May and will eventually be placed on injured reserve. 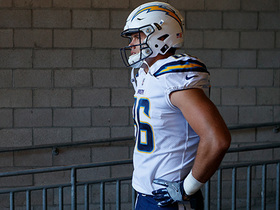 He should have plenty of time to get healthy before Week 1 of 2019, at which point he'll step back in as the Chargers' No. 1 tight end. In the meantime, the Chargers are left with an uninspired group, though Antonio Gates may eventually be re-signed to help the situation. It has been confirmed that Henry, who tore his right ACL on Tuesday, is slated to undergo season-ending surgery, the San Diego Union Tribune reports. Henry tore his ACL in OTAs on Tuesday and will miss the 2018 season, Adam Schefter of ESPN reports. Henry said he's ready to step up after learning that Antonio Gates won't be back with the Chargers, Dan Woike of The Los Angeles Times reports. Henry (abdomen) is healthy and participating in the Chargers' offseason program, Dan Woike of the Los Angeles Times reports. Chargers general manager Tom Telesco said Thursday that he expected Henry (abdomen) to be ready for the start of the offseason program. Analysis: Henry was placed on injured reserve midway through December with a minor laceration of his kidney, which left him sidelined for the final two games of the regular season. However, it doesn't look like the injury will affect the tight end's status for any upcoming offseason work. Expect Henry, who posted 45 receptions for 579 yards and four touchdowns in 2017, to be fully healthy as the Chargers' No. 1 tight end at the start of the season. Henry (abdomen) was placed on injured reserve Tuesday, Ricky Henne of the Chargers' official site reports. Analysis: Henry was placed on IR with a small laceration on his kidney, which he suffered in Saturday night's loss to the Chiefs. His season comes to an end after 14 contests in which he recorded 45 receptions for 579 yards and four touchdowns. 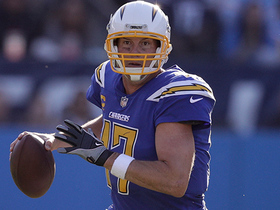 Look for the Chargers to deploy some combination of Antonio Gates, Jeff Cumberland and Sean McGrath for the final two games of the regular season as they fight to stay in the playoff hunt. Henry has been diagnosed with a minor laceration of his kidney, putting his status up in the air for the final two weeks of the season, Jack Wang of the Los Angeles Daily News reports. 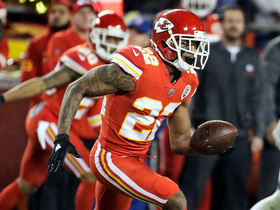 Henry suffered an undisclosed injury during Saturday's loss to the Chiefs, Chris Wesseling of NFL.com reports. Analysis: Henry did catch all three of his targets, but they ended up being for an empty 28 yards, and Antonio Gates ended up with the Chargers' only receiving score. More to follow on Henry's status for next week's must-win game against the Jets, but at least he'll have an extra day to recover. Henry (calf) returned to a full practice Wednesday. Analysis: Henry is thus on track to suit up Saturday against the Chiefs. He's on the Week 15 fantasy radar, having come on of late, while hauling in 16 passes (on 20 targets) for 207 and two TDs over the course of his last three games. Henry (calf) was limited in practice Tuesday. Analysis: Henry appeared on the practice report after logging 43 snaps in Sunday's win over the Redskins. The tight end has been limited in practices earlier this season but has never missed a game. Should he miss any time, veteran Antonio Gates would likely see increased offensive reps.
Henry hauled in four passes (on six targets) for 50 yards and a touchdown in Sunday's victory over the Redskins. Analysis: Henry turned in a third-straight solid performance in Week 14, bringing in an eight-yard scoring toss from quarterback Philip Rivers in the first quarter. 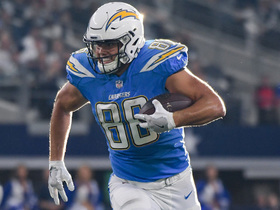 With the Chargers offense rolling and Henry serving at a fairly shallow tight end position, he will be a great fantasy option in most formats over the last three weeks of the season. Though it was expected that Henry (knee) would be limited at practice Wednesday, he wasn't listed on the Chargers' initial Week 14 injury report. Analysis: Henry came out of the team's Week 13 win over Cleveland with some knee soreness, but it evidently wasn't something that will impact the tight end's status for Sunday's game against Washington. The 2016 second-round pick logged a season-high nine targets against the Browns, hauling in seven passes for 81 yards. Henry (knee) will be limited at Wednesday's practice, Jack Wang of the Los Angeles Daily News reports. Analysis: Chargers head coach Anthony Lynn downplayed the injury after watching Henry catch seven passes for 81 yards on a career-high nine targets in Sunday's 19-10 win over the Browns. Henry's ability to practice Wednesday, even in a limited capacity, puts him on track for a Week 14 matchup with a Washington defense that has yielded the third-most receiving yards to tight ends (67 per game) in the NFL this season. Henry came out of Sunday's 19-10 win over the Browns with a sore knee, but Chargers head coach Anthony Lynn expects the tight end to be okay, Eric Williams of ESPN.com reports. Analysis: Henry didn't appear hobbled Sunday, catching seven passes for 81 yards on a career-high nine targets while playing 71 percent of the snaps on offense. He may show up on the injury report this week, but it doesn't sound as if he's in much danger of missing Sunday's favorable matchup against a Washington defense that's surrendered 9.0 yards per target to tight ends this season. Henry caught seven of his nine targets for 81 yards in the 19-10 win Sunday over the Browns. Henry caught all five of his targets for 76 yards and a touchdown in the 28-6 win over the Cowboys on Thursday. Analysis: The Chargers offense as a whole was efficient, with quarterback Philip Rivers throwing for 434 yards in the win. Henry certainly factored into that equation, compiling 76 yards, more than he had combined in the three weeks prior. His lack of red zone targets will likely hamper his ceiling, but given the Chargers offensive explosion in the last few weeks, Henry remains a low-end No. 1 fantasy tight end, particularly next Sunday against the lowly Browns. Henry was a non-factor in the 54-24 rout of the Bills on Sunday, catching two of his five targets for 25 yards. Analysis: It's clear by this point that Henry is merely the third or fourth option in the Chargers' balanced passing attack, as the offense continues to work through Melvin Gordon and Keenan Allen. Despite seeing the fourth-most targets on the team, Henry is firmly muddled in an offense content on spreading the ball around, and as a result remains simply a high-end secondary option at tight end for fantasy owners. Henry was kept in check Sunday, recording one catch for seven yards in the 20-17 overtime loss to the Jaguars. Analysis: Henry predictably struggled against the Jaguars, with the Chargers rarely looking the second-year player's way. It doesn't get much easier for Henry next week against the Bills, as they've allowed just two touchdowns to tight ends all season. 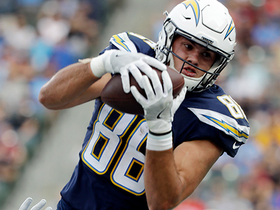 NFL Network's Charley Casserly discusses how the loss of tight end Hunter Henry impacts how the Los Angeles Chargers will run things offensively in 2018. NFL Network Insider Ian Rapoport brings the lastest information on the Chargers loss of tight end Hunter Henry for the season and if the team will re-sign free agent right end Antonio Gates. Los Angeles Chargers quarterback Philip Rivers lofts deep ball and Kansas City Chiefs cornerback Marcus Peters picks of the pass. Los Angeles Chargers quarterback Philip Rivers throws a pinpoint 8-yard TD pass to tight end Hunter Henry. 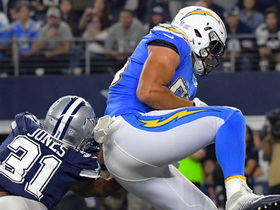 Los Angeles Chargers quarterback Philip Rivers hits tight end Hunter Henry for a gain of 20 yards. 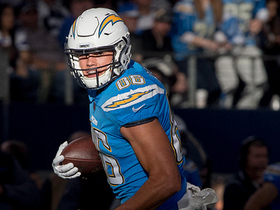 Los Angeles Chargers quarterback Philip Rivers finds tight end Hunter Henry for 25 yards. 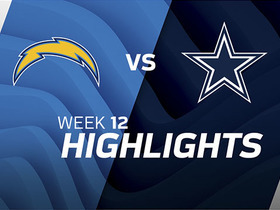 Check out highlights from the matchup between the Los Angeles Chargers and the Dallas Cowboys on Thanksgiving in Week 12. 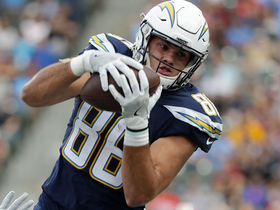 Philip Rivers finds Hunter Henry for first touchdown of the game. Phili Rivers finds Hunter Henry for 22-yard gain. 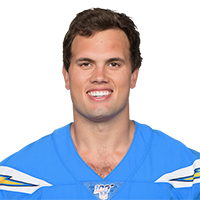 Los Angeles Chargers quarterback Philip Rivers finds tight end Hunter Henry for a 17-yard gain.